No blasphemy could be more heinous than this crime, no matter what the magazine published or whom it offended. Judgment belongs to God. Those who claim to defend Islam with violence and horror are essentially asserting that God is incapable of carrying out His will and so they must act in His stead: that’s blasphemy. It’s hard to believe that this has all played out since the last Sift. On Wednesday gunmen killed 12 cartoonists and other staffers at the satirical French publication Charlie Hebdo. One suspect soon gave himself up, while three others have been killed by police. One is still at large. The attack has been linked to the killing of a French policewoman. The suspect in that case barricaded himself with hostages in a kosher supermarket. He was killed by police, and four of the hostages died. We don’t usually think of Wikipedia as a source for current events, but it is usually a good way to follow events like this, where details trickle out in no particular order and sometimes change from one day to the next. Wikipedia’s continuously re-edited article on the shooting is keeping track of what we know so far. 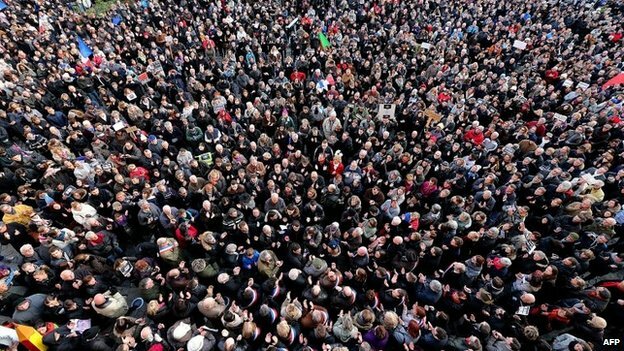 Well over a million people rallied for unity in Paris Sunday, and millions more across France. The BBC article on the rallies included this picture from Reims. Adam Gopnik wrote a very thoughtful piece for BBC News, making personal connections both to one of the murdered cartoonists and to a Muslim couple he knows in Paris. This is a point frequently forgotten: When you lash out at groups (whatever the justification), you lash out at individual people, the great majority of whom don’t deserve it. Of course there are conspiracy theories attributing the killings to everyone from the CIA to Mossad. But so far they seem to be coming mainly from people who attribute everything to the CIA or Mossad. These false-flag theories claim that the purpose is to justify a new round of the War on Terror or to scuttle recent Palestinian diplomatic initiatives to Europe. If it’s a frame-up, the framers did a good job. One of the alleged killers trained with Al Qaeda in Yemen, and AP says someone in that group claims responsibility. The supermarket hostage-taker left a jihadi video. Two theories about why this happened seem credible to me. The first is the most publicized one: This is revenge for dishonoring Muhammad. Almost certainly this is what the men doing the shooting believed. The problem for a terrorist group like al-Qaeda is that its recruitment pool is Muslims, but most Muslims are not interested in terrorism. … But if it can get non-Muslim French to be beastly to ethnic Muslims on the grounds that they are Muslims, it can start creating a common political identity around grievance against discrimination. If that really is the point, it might be working. Coverage of the avenge-the-Prophet motive may be somewhat off-base. Vox claims the issue may have more to do with community identity than with any theological dogma. [A]lthough religious identity may be the source of anger over the cartoons, that does not mean that the objections are necessarily theological. In fact, despite widespread belief to the contrary, there may be no such theological restriction at all. The Koran does not specifically prohibit insulting the Prophet, Aslan said. Mogahed noted that there was no agreement within mainstream Islam over what constitutes blasphemy, what the response to it should be, or how it should fit within the context of freedom of speech. It would therefore be a mistake to reduce an entire cultural identity to a narrow question of religious law. If you frame the shooters’ motive as punishment of blasphemy, most Americans feel distant from it. But community identity hits closer to home. In that context, ridicule of the Prophet looks more like flag-burning. As far as I know, nobody has been killed for burning an American flag. But we have seen repeated efforts in Congress to remove freedom-of-speech protection from flag-burning, and in discussions of flag-burning, it is not unusual to hear threats of violence against the burners. [D]ifferences of opinion and thought cannot justify murder. Supporters of Al Qaeda and ISIS seem to be the only people celebrating the attack. I know most Muslim people would not have carried out an attack like this. But here’s the important point. Hundreds of millions of them support an attack like this. They applaud an attack like this. A related story that is getting much less coverage concerns the situation of French Jews, who have seen attacks on them — like the killing of hostages in the kosher supermarket — increase substantially in recent years. I don’t feel like I really understand this situation, but I believe it isn’t a re-awakening of traditional Dreyfus-Affair-style French anti-Semitism. It seems more like immigrant Arabs and other Muslims are taking out their anti-Israel anger on French Jews. Last year, 7,000 emigrated to Israel as anti-Semitism spiked across France, … double the previous year, making France, for the first time, the No. 1 source of immigration to Israel. So yes, hostility to Israel motivates attacks on French Jews, whose emigration not only makes Israel stronger, but emphasizes the reason Israel exists. Strategically, this is totally backwards. If French Israel-haters really want to hurt Israel, they should do their best to make France the destination-of-choice for persecuted Jews. This week Boko Haram killed hundreds, maybe as many as two thousand civilians in Baga, a border town between Nigerian and Chad. It isn’t drawing even a fraction of the coverage of the Charlie Hebdo killings in Paris. I would amend that to say “perceived distance”. I’m thousands of miles from Paris, but I’ve been there and I think of Parisians as being more or less like me. By comparison, the back country of Nigeria seems infinitely far away. Hundreds or thousands of innocent people dead? Why should Americans care about that? James Fallows has been writing about military issues in The Atlantic for decades. I’ve consistently found him to be reasonable and thoughtful. This month’s cover article “The Tragedy of the American Military” is well worth your time. It centers on the problems of being a “chickenhawk nation”: Unlike previous generations of Americans (most of whom either fought in America’s wars or had parents, siblings, or children who did) today’s Americans are largely insulated from the military. Increasingly, wars are fought either by the underclass (who need a place to start their careers and have few other options) or by men and women from families with a military tradition. Outside that small caste of military families, middle-class and upper-class voters — the people whose opinions count most in our semi-oligarchic system — can have opinions about war with no consequences, or can ignore the military altogether. The result is that the military and its issues play mostly a symbolic role in our politics. We “support our troops” with bumper stickers and in football halftime shows, but we don’t really think that hard about where we’re sending them, how we’re equipping them, or what we expect them to accomplish. One result is that we end up losing wars. Few people say this so bluntly, but Fallows thinks that if you compare our recent military operations to the objectives we had going in, the only ones that count as successes are the 1991 Gulf War and the raid that killed Osama bin Laden. I am a United States Army General, and I lost the Global War on Terrorism. It’s like Alcoholics Anonymous. Step one is admitting you have a problem. Well, I have a problem. So do my peers. You can get a taste of Bolger’s viewpoint from his NPR interview in November. [A] plane designed to do many contradictory things—to be strong enough to survive Navy aircraft-carrier landings, yet light and maneuverable enough to excel as an Air Force dogfighter, and meanwhile able to take off and land straight up and down, like a helicopter, to reach marines in tight combat circumstances—has unsurprisingly done none of them as well as promised. Fallows believes that if we weren’t a chickenhawk nation — if our politically powerful classes knew that their children would be operating these systems or depending on them for battlefield support — we would be having a different conversation with a different outcome. I continue to believe that Elizabeth Warren isn’t running for president. But if she were, she would have to write a stump speech about what’s wrong with America and what she wants to do about it. She gave that speech Wednesday to the AFL-CIO. Predictably, Conservative Tribune, which supports gun rights in other situations, finds this group “alarming” and emphasizes that “this is neither a joke nor a ‘Chappelle’s Show’ sketch.” Presumably, that reference to black comedian Dave Chappelle is supposed to emphasize the inherent absurdity of non-whites claiming equal Second Amendment rights. while the gun rights of average Americans are under assault from the Obama administration, these guys don’t even get the slightest bit of attention. Naturally, their article provides no facts to support the idea that the administration is treating white and black gun-owners differently in any way. CT itself is doing that, not Obama. The 2nd Annual New Hampshire Rebellion winter walk against money in politics has started in Dixville Notch. « Am I Charlie? Should I Be? Thanks for the Wikipedia shout-out as a source for breaking news stories. I often turn to Wikipedia in cases where events are developing, because the editors excel at dispassionately assembling just the neutral facts, without all the talking head speculation and sensationalism of the mainstream news media. I am not comfortable with the term “double standard” wrt evaluating violence against other religions by Christians vs Muslims. I don’t know enough to say myself but I see no reason to simply assume that the tenets of Christanity and Islam hold to a common standard in this regard in the first place. In any case, it’s clear that such broad strokes cannot capture the picture of the diverse reality that exists. A single standard is clearly not accepted by all Christians or all Muslims. The most recent widespread violence of Christians against other religions that I’m aware of was the Lebanese Civil War of 1982, when Israel attempted to topple the Lebanese government by fueling hatred among the oppressed Christian minority and arming them. I recommend the French film “Incendies” (“Fires”) which depicts that war from a very human perspective of two contemporary, naive french adults exploring their Lebanese roots in the war. Seeing images of the Virgin Mary taped onto assault rifles, or Christians executing a Muslim for daring to marry a Christian is a sharp reality check for complacent Christians who believe “that could never happen to us in this day and age”. I interpreted that poll much more abstractly. I think when somebody of one’s own faith does something horrible, it’s easy to say “That doesn’t really represent us.” But it’s also easy not to give other faiths the same benefit of the doubt. I will suggest you do more thorough research, as the demographics of our modern Armed Forces closely mirror the overall demmographics of the United States Population. These numbers are readily available from each of the Armed Services recruiting component headquarters. It is not largely the underclass with few other career opportunities who serve. Military entrance standards make it so that fewer than 1 in 4 people from age 17-24 actually meet the minimum requirements to qualify for service. In terms of personnel acquisition the military is looking for and competes for the same kinds of qualifications as most employers. We are long past the years where the military is the career of last resort taking in only the underclass. By “underclass” I did not mean the unqualified. I mean people who don’t have the kind of family connections that put a career on the fast track. I’ll look, but I suspect one demographic category the military doesn’t track is parents’ income. In particular, I’ll bet the children of the 1% are grossly under-represented. Just speaking for myself, I had no close relatives in Iraq or Afghanistan, and only one close friend. His family had a military tradition. When I talked to friends about the wars, nobody told me about their loved ones in danger. By contrast, when I was growing up in the Vietnam era, everybody knew somebody who had been to the war or was afraid they would be going soon. I’ll put some kind of correction in next week’s summary. I haven’t decided yet how far I’ll have to back off. For what it’s worth Doug (sample of 2), my experience matches yours. Even though both my father and his father served in the military, I was encouraged not to, and none of my friends had family members serving either. On the other hand, in branches of my wife’s family it seems like almost everybody serves/served for generations giong back to the Civil War. So from my perspective there indeed seems to be a class-based distribution, and I completely agree that as a whole our country seems disengaged with no skin in the game, which is unhealthy and leads us into wars we otherwise would not engage in. That said, as somebody too old to begin military service I would be reticent about suggesting that we adopt a more egalitarian system such as conscription. Hi, I think the quote is from John Galsworthy, but you may have mixed up two of them…. “idealism increases in direct proportion to one’s distance from the problem” and “Headlines twice the size of the events”, not sure about number of deaths. Amazing points right here. Now i am extremely happy to look a person’s content. Many thanks a good deal exactly what having a look ahead to call anyone.. Bobby Seele Do you want to make sure you shed us a snail mail? It’s interesting to me that you’re thinking of Elizabeth Warren’s AFL-CIO speech as a sort of a stump speech. I’ve never heard her speak about anything other than economic issues, and after reading the text of the speech,, surprise surprise, I still haven’t. I’ve been wondering if her insistence on not running for president doesn’t have at least a little to do with a total disinterest in foreign policy. Or maybe I just haven’t been paying enough attention. That’s an interesting observation. Maybe Warren sticks with economic issues because that’s what she’s best at and best known for. As a Senator, Warren can have a focused “brand”, while a Warren presidential candidacy would have to speak out on everything.